Organic Synthesis, Fourth Edition, provides a reaction-based approach to this important branch of organic chemistry. Updated and accessible, this eagerly-awaited revision offers a comprehensive foundation for graduate students coming from disparate backgrounds and knowledge levels, to provide them with critical working knowledge of basic reactions, stereochemistry and conformational principles. This reliable resource uniquely incorporates molecular modeling content, problems, and visualizations, and includes reaction examples and homework problems drawn from the latest in the current literature. In the Fourth Edition, the organization of the book has been improved to better serve students and professors and accommodate important updates in the field. The first chapter reviews basic retrosynthesis, conformations and stereochemistry. The next three chapters provide an introduction to and a review of functional group exchange reactions; these are followed by chapters reviewing protecting groups, oxidation and reduction reactions and reagents, hydroboration, selectivity in reactions. A separate chapter discusses strategies of organic synthesis, and he book then delves deeper in teaching the reactions required to actually complete a synthesis. Carbon-carbon bond formation reactions using both nucleophilic carbon reactions are presented, and then electrophilic carbon reactions, followed by pericyclic reactions and radical and carbene reactions. The important organometallic reactions have been consolidated into a single chapter. Finally, the chapter on combinatorial chemistry has been removed from the strategies chapter and placed in a separate chapter, along with valuable and forward-looking content on green organic chemistry, process chemistry and continuous flow chemistry. 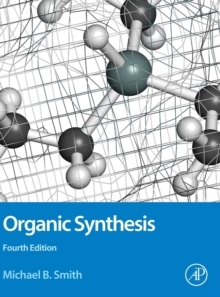 Throughout the text, Organic Synthesis, Fourth Edition utilizes Spartan-generated molecular models, class tested content, and useful pedagogical features to aid student study and retention, including Chapter Review Questions, and Homework Problems. PowerPoint (c) presentations and answer keys are also available online to support instructors.